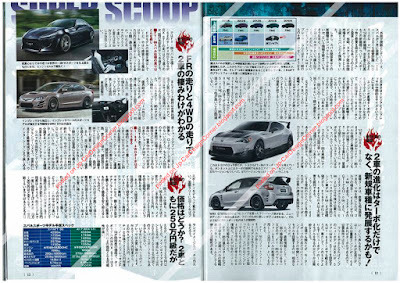 BC has published an article with the latest scoop on the FT-86 / BRZ. According to a summary that I was provided with, Toyota is planning to fit an 1.6-liter turbocharged engine one year after the initial introduction of the model. Now, what seems rather strange to me is the fact that BC claims that the turbocharged engine will be fitted in the G's / STi versions, while the "normal" versions will be powered by the naturally aspired 2.0-liter engine. In any case, the article also mentions that the new turbo engine will be fitted in the new Subaru Impreza WRX STi as well, producing 270ps. BC also claims that the differences between the FT-86 and the BRZ (or whatever the official name will be) will be on the front and rear ends. I'm still waiting for the 2 door WRX, lol. Subaru thinks about a return to WRC (the only major motor sports event they ever were successful in), and 2012 rules require 1.6 TC engine.